We've already had people ask if they can decline the ability that comes with a gold tag badge to insta-close-as-dupe questions in their tags. I did this by accident today myself. On reflection, I decided not to reopen, and my asker thanked me for finding the dupe, so that question is staying closed. But I think it would be nice to remind us as we do this that our word will be law. Maybe a small gold dot on or near the final button that we click after entering the possible duplicate? 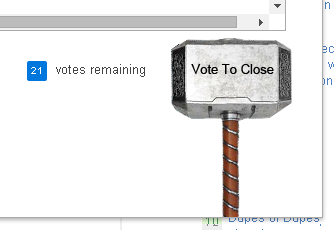 If the button says "Vote To Close" when you have super powers, the text is actively misleading. The action is not a vote action, it is a close action. The button should say "Close". That is, I think UX considerations suggest the button should not have its current label. Shog9, in his answer, says he does not want the two modes distinguished, as voters should not be unsure about whether a post should be closed when they vote to close. That could be achieved by labelling the button "Close" in both modes. We're keeping this intentionally minimalistic starting out: let's face it, this the biggest change we've made to the actual criteria for closing in a good long while, so it's worth taking some time to see how it's actually used. At minimum, we'll be adding a note to the documentation noting the attachment of a new ability. I believe this is only the third time we've ever tied a privilege to earning a badge (the previous two being review access and moderator election nominations), so there's not a lot of precedent here - finding a good way to announce this might be tricky. Philosophically, I'm against calling out binding votes in the UI: one of the persistently troubling themes we've seen over the years has been this notion that by voting you are somehow abdicating responsibility! Seeing close voters - even experienced folk like yourself - pause to think about how they're voting when there's the possibility of that vote having immediate effect is... Refreshing. Perhaps then, it would make more sense to remind folks of the responsibility that comes with voting all of the time, not just in cases where they stand a good chance of seeing immediate results? Your vote tells the system that this question should be closed - which may then happen immediately. If you're not sure, then do not vote. I freely admit I'm more likely to close vote just because other people already have. And since I'm being honest, I'll also say that I'm somewhat irked by being told this is a bad habit, and that it's therefore my fault if for any reason I give less than my highest level of attention to every VTC. Since I don't evaluate every question on English Language and Usage, but I do regularly go through the review queue, it stands to reason that I see more questions where others have already VTC'd. And the site search facility is particularly bad on ELU (because it ignore many words which are irrelevant "noise" on other sites, but highly significant on ELU), so checking for dups (more importantly, identifying the most appropriate one) can get quite tedious. If I see that other people have already identified an earlier dup, it's ridiculous to suppose I'll always double-check as carefully as I might otherwise have done. Especially if four other people have identified the same dup, and the two question titles strongly suggests they cover the same ground. That's my first gripe. My second, which I find far more bothersome, is that as things stand, I feel my new superpower is effectively unpredictable. I don't actually know which particular tags I'm currently eligible to "instaclose", and I really don't see why I should be expected to go and check my context-specific status regularly to keep tabs on this. As an aside, I'll just point out that I don't think tags work very well on ELU. Things may vary by site, but on ELU few if any users know or care about distinguishing between idioms, expressions, and phrases, for example (for all of which I have silver badges which could "go for gold" at any time). The idea that not knowing the effect of my VTC will encourage me to exercise it more carefully seems to me misguided, puerile, schoolmarmish, and dismissive. The system obviously knows (or will find as soon as I do VTC), so I see no possible justification for it not telling me what my relevant status is. If you don't think the question should be closed, don't vote to close it. If you're not sure, don't vote to close it. Your gold-badge binding vote should be thought of no differently than a tipping vote cast on a post that already has n-1. And if you're currently in the habit of being more likely to close vote just because other people already have, then that's a habit you should try your hardest to drop! Not the answer you're looking for? 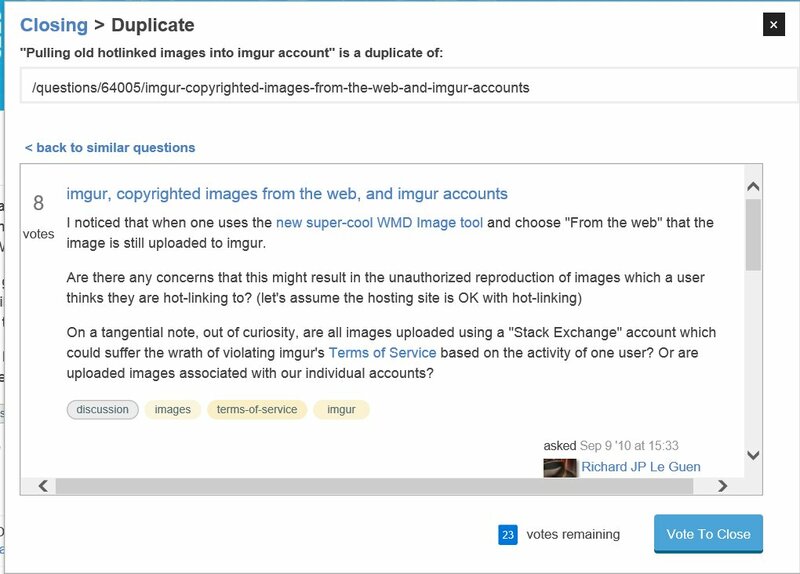 Browse other questions tagged feature-request vote-to-close user-interface duplicate-questions dupehammer . How Do I Opt Out of Privileges? Why doesn't dupehammer work when it's the fifth vote? Include a more descriptive message when accounts are deleted on the effected accounts that have rep removed?